Take a stroll or take a drive. Our historic districts each have a story to tell. Mobile’s downtown streets are lined with 100-plus-year-old buildings in traditional French and Spanish styles showcasing ornate, iron-clad balconies that are perfect for watching Mardi Gras parades. After all, Mobile IS the birthplace of Mardi Gras! 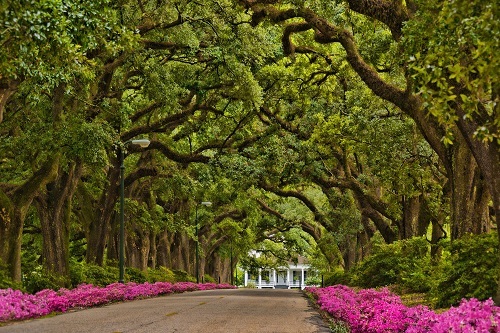 Historic districts such as the Oakleigh Historic Garden District, De Tonti Square Historic District and Midtown Historic District offer lane after oak-covered lane of double-gallery columned homes or massive, ornate Southern mansions with vast gardens, large verandas or Victorian motifs. Guided tours are available to help get the most out of both viewing and learning about this historic, 17th century city and the gorgeous homes, parks and gardens spread throughout. The “Eastern Shore style,” as many here call it, is a refined yet relaxed deep-south style that blends the splendor and beauty of large, stately homes with high ceilings, wood floors, marble tables and immaculate gardens, with the more coastal-cottage style of board and baton, brick and craftsman columns and transoms. Drive through the beautiful, bayside streets of Fairhope, down Scenic Highway 98, and on through Point Clear, where you will see long, live-oak and magnolia-lined driveways leading to magnificent bayside homes that immediately fill your thoughts of grand parties and balls that surely have been enjoyed in this most special area. The Greek Orthodox Church of Byzantine architecture opened in 1965 in memory of Jason Malbis, founder of Malbis Plantation. Beautiful murals depicting the life of Christ, carved marble and vivid stained glass decorate the church. Take a walk through history along the two-mile trail at Bicentennial Park in Stockton. The Baldwin County Bicentennial Park is a 367-acre area in North Baldwin County, which was designated by the Baldwin County Commission during the County’s Bicentennial in 2009. The park is dedicated to preserving the county’s rich cultural heritage and leaving a historical legacy for future generations. The Historic Montpelier Methodist Church, located at the Bicentennial Park, was built in 1895 and donated to Baldwin County by the Thomas John Earle family in 2012. The church is a historic landmark in Baldwin County and was previously located in the Blacksher Community. The Church once served as the home of the annual district meetings of the local Methodist churches which were held each fall. While an active church, the congregation was led by a visiting Methodist minister from Stockton, Alabama who traveled by horseback to Blacksher to conduct services every other Sunday. The Church is an exquisite example of 19th century period architecture and still includes its original pews, pulpit, chandeliers and stained glass windows. Walk through historic downtown Bay Minette, where the city library, the Blackburn and Rex Parks, the Clock Tower and the charming Kahalley House exemplify this town’s old-time charm. Capture the magic of the old days of choo-choo transport by visiting the Foley Model Train and Railroad Exhibit and Park in historic downtown Foley. A delightful display of model trains crisscross an elaborate miniature train city, town, woods and forest. Visit the historic Swift-Cole House, just a few miles west of Foley, where an antebellum, two-story columned home rests beneath the moss-draped live oaks on the banks of Oyster Bay.